How Do You Solve a Word Problem with Exponential Decay? 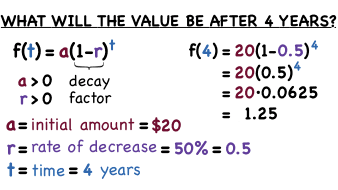 If something decreases in value at a constant rate, you may have exponential decay on your hands. In this tutorial, learn how to turn a word problem into an exponential decay function. Then, solve the function and get the answer! Looking at an equation with a variable in the exponent? You have an exponential function! Learn about exponential functions in this tutorial. How Do You Solve a Word Problem with Exponential Growth? If something increases at a constant rate, you may have exponential growth on your hands. In this tutorial, learn how to turn a word problem into an exponential growth function. Then, solve the function and get the answer!